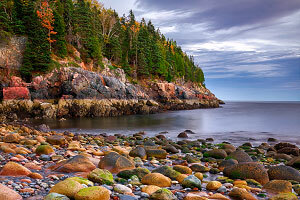 The eastern side of Mount Desert Island south of the vibrant tourist town of Bar Harbor is the most popular section of Acadia National Park. The one-way Park Loop Road offers amazing views of the rugged coastline and tourists who hike the Ocean Path are treated to a more intimate experience along the pink granite formations. 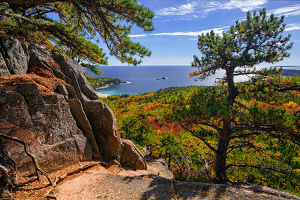 Famous landmarks include Sand Beach (the only sandy beach on Mount Desert Island), Thunder Hole (a spot where waves often crash loudly), and the Beehive (one of Acadia's signature hikes for those who can control their fear of heights). 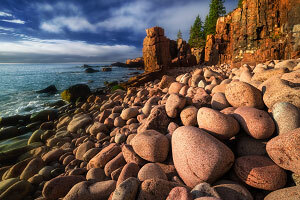 One of the crown jewel features of Acadia National Park is the beautiful coastline with its jagged pink granite formations standing up to the never-ending assault of the ocean's waves. Ocean Path is a family-friendly trail that follows a dramatic stretch of coastline between Sand Beach and Otter Point. Along the way, you will encounter several famous landmarks, including Sand Beach, Thunder Hole, Monument Cove, and Otter Cliff. While the trail runs right along the main Park Loop Road, it is well worth it to go for a stroll on this trail. You simply can't get the full view from within your car. Rating: fairly easy family-friendly hike. Nestled in a nice little cove protected from the Atlantic Ocean, Sand Beach is Acadia's only sandy beach and is a popular spot for people to relax and play along the shore, despite the usually frigid water temperatures. Just to the east is the Great Head peninsula, and while it may look rather insignificant from the beach, the far side of the peninsula has sheer cliffs that tower 100 feet above the ocean. Before or after enjoying some leisurely time on the beach, a hike around Great Head is a great 1-2 hour diversion to see some of Mount Desert Island's most impressive sections coastline. Rating: fairly strenuous and exposed hike with iron aides. The Beehive is the majestic peak that overlooks Sand Beach from the northwest. The hike up the Beehive Trail (aka. 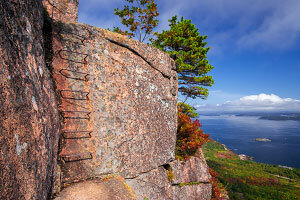 the Beehive Cliffs Trail) is a thrilling Acadia classic, but it is not recommended for anybody with a fear of heights. This ingenious route heads right up the steep south face of the peak and includes granite steps, iron rungs to climb up, and several handrails for exposed rock scrambling sections. Those who control their fear of heights are rewarded with incredible views of Sand Beach, Great Head, and the surrounding area. Rating: Strenuous and exposed route with iron aides. 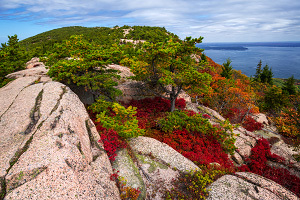 Located roughly a mile north of the Beehive and Sand Beach, Champlain Mountain is the 6th tallest peak in Acadia National Park and the cliffs along its east face are some of the most impressive. The Precipice Trail is an ingenious route that heads up these steep cliffs, navigating the various fault lines and shelf systems. Numerous iron rungs, ladders, handrails, and wooden bridges help hikers at the more difficult and exposed sections. As such, this trail may seem more like a via ferrata climbing route than a simple hike. 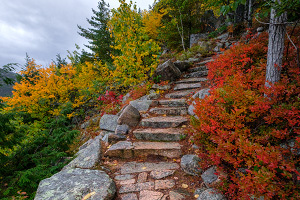 Like many other peaks in Acadia, Champlain Mountain has trails leading up to its summit from all directions of the compass. Heading up the west face of Champlain Mountain is the Beachcroft Path, a relatively short but fairly strenuous trail that loops around Champlain's smaller companion peak, Huguenot Head, offering some wonderful view of the valley below before summiting Champlain. This route has also been known as the "Beachcroft Trail", but the name "Beachcroft Path" is now officially used to emphasize the manufactured nature of the route. 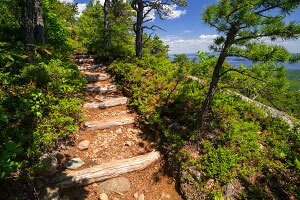 The final steep push to the top of Champlain Mountain, however, is hardly a "path." Rating: moderately to fairly strenuous day hike. While the majority of Acadia's peaks have multiple trails that lead to the summit, the east face of Dorr Mountain may be the winner as far as hiking options go. From the Sieur de Monts Spring and Nature Center parking area, there are three separate routes that start climbing the base of the mountain. Shown on some maps collectively as the "Dorr East Face Trail," these stretches of trail--the Emery Path, Homans Path, and Kurt Diederich's Climb--each have their own unique charm and continue up to the summit of Dorr Mountain. Rating: fairly strenuous hike with iron aides. Like most peak systems in Acadia, Dorr Mountain is a narrow north-south formation with steep cliffs on its east and west faces. This peak has four separate trails that lead up to the summit, but the most interesting route is known as the Ladder Trail--a challenging trail that works its way up the steep east face with the help of a few ladders and iron rungs. Despite its ominous name, this trail is a bit less exposed and intimidating than the Beehive or Precipice Trail. 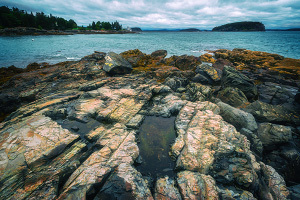 Located in Frenchman Bay just north of the tourist town of Bar Harbor are several small islands including the Porcupine Islands and Bar Island. 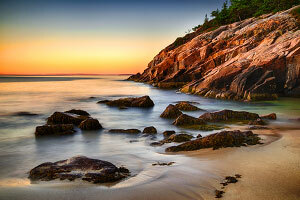 Bar Harbor's namesake feature is the long shallow bar that runs through the water between town and Bar Island. 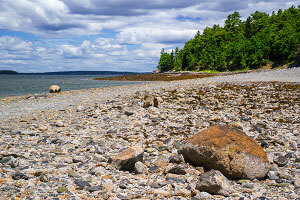 During low tide, the bar becomes dry land and allows tourists to experience a unique little hike onto the island, which is officially part of Acadia National Park. Located less than a mile south of downtown Bar Harbor, George's Dorr's Old Farm property is protected as a small isolated section of Acadia National Park. The Compass Harbor Trail is a short and family-friendly walk that heads through the forested old estate and ends at Dorr Point, a granite outcropping that overlooks Compass Harbor and the Porcupine Islands in the distance. The ruins of the Old Farm estate are located on top of the hill above, although only the foundation remains. 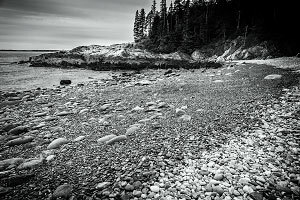 A trip to Acadia National Park would not be complete without doing a hike to one of Mount Desert Island's cobblestone beaches. Located on the southern coast of the east side of the island, Hunters Beach is a beautiful cove covered with ocean-tumbled rocks and a babbling brook flowing through the rocks into the ocean. The family-friendly Hunters Beach Trail also takes hikers through some beautiful thick forest scenery, including a section of young pines. 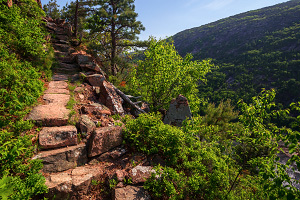 Located on preserved land just outside of Acadia National Park proper, the Lower Day Mountain/Hunters Cliff Trail is a mile-long stretch of trail that connects the Day Mountain Trail with Hunters Beach. Starting at the Day Mountain parking area, the trail heads southeast up the barely noticeable Lower Day Mountain and then down to the cliffs above Hunters Beach Cove. While the main trail doesn't get too close to the water, there are a few spots where you can leave the trail and explore the beautiful granite formations above the Atlantic Ocean. Little Hunters Beach is a quaint little cobblestone beach located west of Otter Point, along the south-facing coastline of Mount Desert Island. This spot isn't really a hike per se, but it is a fun little shoreline stroll. To find the trailhead, drive along the one-way Park Loop Road. Roughly 1.5 miles past Otter Cove, the road crosses a stone bridge; this is Little Hunters Beach! Park along the road in the handful of pullover spots. While this isn't a destination hike, this is a good spot for those looking for a simple leisurely stroll in some pleasant Maine coastline scenery. 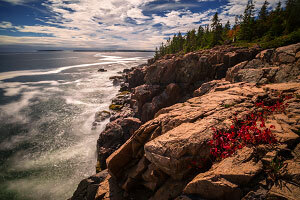 Located just outside of Acadia National Park, on the southeastern side of Mount Desert Island near the town of Seal Harbor, Cooksey Drive Overlook is a short family-friendly stroll to a great little viewpoint. 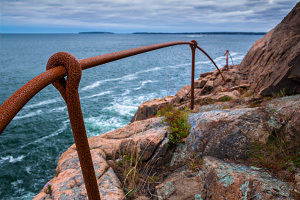 This trail is maintained by the Maine Coast Heritage Trust and offers a wonderful dramatic view from the top of some sheer granite cliffs with the Atlantic Ocean pounding at the coastline below. 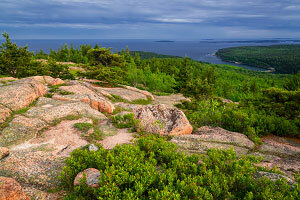 ACADIA CLASSIC: a must-do hike if you want to see the best of Acadia! WARNING: a hike that may have scrambling, significant exposure, and/or sections of iron rungs or other aides.